Christmas is a great excuse to make a giant, juicy, meaty roast studded with rosemary, garlic and any other aromatics you want. Christmas is a great excuse to make a giant, juicy, meaty roast studded with rosemary, garlic and any other aromatics you want. This quick video with chef Michael Tusk will make you an expert studder in no time. And these delicious roasts will put those skills to work. This extravagant roast gets delicious flavor from garlic, cloves and lots of citrus. Glazed with a sweet-and-spicy mix of pepper jelly and pomegranate juice, this delicious ham is deceptively simple to make. The best pairing for this luscious pork shoulder? Champagne, of course. 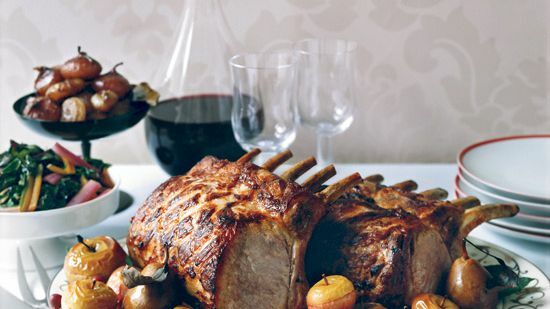 This impressive bone-in leg of lamb will take guests’ breath away. The sweet pear-cider glaze is delicious with savory meat. This spicy roast takes just ten minutes of active prep time. Wrapping the roast in bacon keeps the meat juicy.